I’ve had one of the manual pasta machines for a couple years, and a few weeks ago I got it out for the… uhhh… first time. But, I’ve used it twice now in the last two weeks, so I’m trying to make up for those lost years. It is, of course, well worth the effort. Not as easy as opening a box, obviously, but not overly difficult or time-consuming (the longest part is letting it rest), and much better than the usual boxed stuff. Basic homemade pasta is pretty simple. First, dump about 2 – 2 1/2 cups of flour on the counter or another flat surface. Make a crater in the middle of the mound, and break three eggs into the crater. With a fork, break the eggs up a bit, and start to work the flour into the eggs. As the eggs become incorporated into the flour, you can start to use your hands finish the mixing. If it’s too sticky, add flour about a tablespoon at a time as necessary. Once it’s fully mixed, the dough needs to be kneaded until it’s smooth and elastic, which took a few minutes. If you’re not sure of proper kneading technique, I’m sure there are a bunch of how-to videos on YouTube. When the dough is finished, form it into a ball, and put it into a bowl to rest for no less than an hour. When you’re ready to start the actual pasta part, cut off about a third or half of the dough ball. Flatten with your hands into a small circle. Here, you can use a rolling pin – push the dough away from you, and continue to rotate the dough as you roll, until it’s about 1/8″ thick (or if you don’t have a ruler handy, til it’s very thin, but not quite paper-thin). 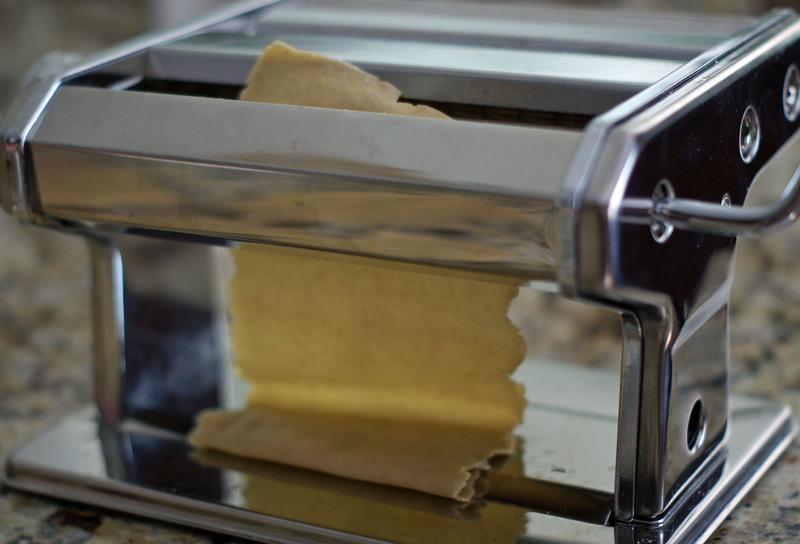 Alternatively, use a pasta machine by feeding the dough through it – start on the widest setting and gradually work down to the thinnest setting. You’ll definitely need to cut the dough into smaller pieces as you go, since it gets much bigger as it stretches. 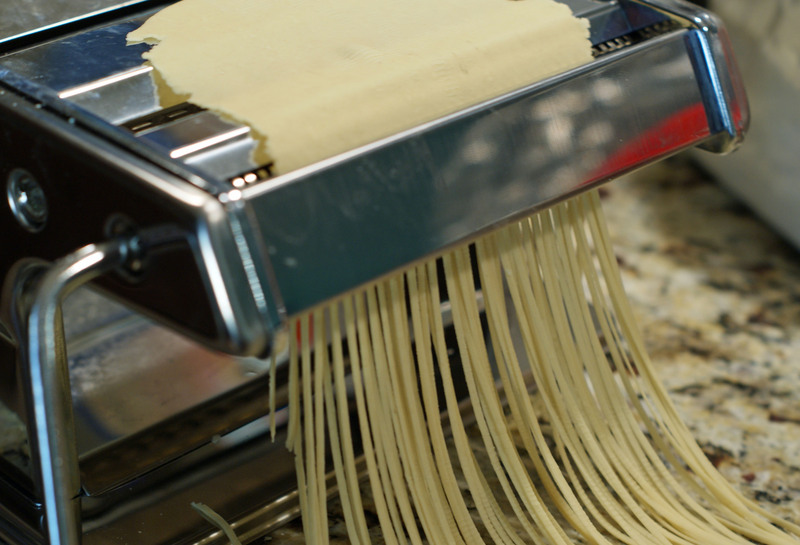 When all the dough is thin and ready, let it sit for a good 15 minutes to allow the surface to dry – if you try to work it while it’s too fresh, the noodles may all stick together, which makes eating spaghetti difficult, to say the least. After the dough has rested, you can start cutting! Here’s where the pasta machine really comes in handy. Feed the strips through the machine while cranking, and out come little noodles! If you don’t have a machine, you can cut the strips by hand with a sharp knife, or they also sell little pizza slicer looking gadgets that have multiple wheels to cut several noodles at once. Handle the noodles gently, keep them laying flat, and again, let them dry for a few minutes before cooking. If you get too aggressive with your pasta, you’ll squish everything together and end up with a ball of dough again. Cooking only takes a few minutes in boiling water since it’s fresh. Don’t cook it like regular boxed pasta or it will end up overdone! The finished pasta has a smoother texture than most store-bought varieties. Serve however you’d serve any other pasta. We had some with a mushroom and pea stir-fry, and some with olive oil, basil, tomatoes, and some diced provolone cheese. You really can’t go wrong. Sometime I’d like to try stuffed pasta, so stay tuned. I have grand ideas of making large batches of ravioli and freezing them for later dinners. C-man can’t eat eggs right now either, so I’m also looking to try an egg-free recipe, probably using semolina flour. Make a mound with the flour on the counter, and create a crater in the middle. Break the eggs into the crater, then, using a fork, gradually work the eggs into the flour. Add a pinch of salt, then knead the dough for several minutes or until smooth. Add small amounts of flour or water if the dough is too sticky or dry. Form the dough into a ball and let it rest, covered, for a solid hour. If my instructions weren’t any good, here‘s a good primer on homemade pasta-making. ​​I'll try not to bug you too much​​​, and you can unsubscribe at any time.